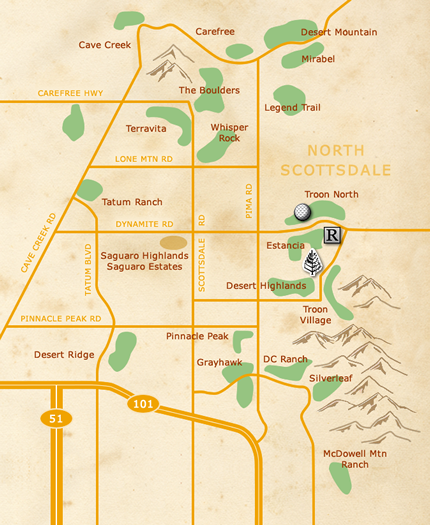 North Scottsdale is home to some of the finest desert golf courses, restaurants, shopping and recreation in Arizona. The area is made up of an extensive collection of distinctive communities, each with an abundance of open space and rugged, natural topography. Our agents are ready to guide you through the wide varitety of extraordinary, high-end properties located in North Scottsdale and help you discover the home that fits your unique lifestyle. The spectacular real estate in this area was developed by high-end production builders, as well as, custom homebuilders. Surrounded by majestic mountains and towering Saguaro cactus, this is truly an inspiring place to call your home.